The (former) Elkin & Alleghany Railroad Office has been designated as an "Certified Historic Structure and Rehabilitation" by the US Dept. of the Interior. 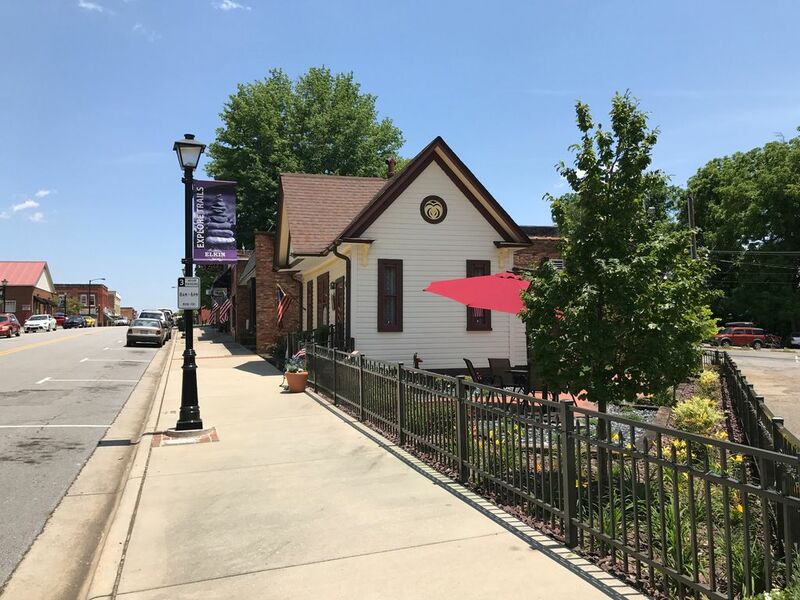 In addition, the railroad office received an Award of Merit for "Best Historic Rehabilitation Project" in 2017 from the NC Department of Commerce Main Street program. Located in Downtown Historic Elkin on the west end of Main Street, we sit at the crossroads of the OverMountain Victory National Historic Trail, the Mountains-to-Sea Trail, and the Elkin and Allegheny Rail Trail. We are centrally located in the Yadkin Valley Wine Region with more than 40 tasting rooms to explore. Convenient to local downtown restaurants, shops, and entertainment. Enjoy the events at Elkin Municipal Park, which is a short walk away. Relax with the peaceful sounds from the Big Elkin Creek waterfall across the bridge. After 19 months of planning and rehabilitation work, the railroad office was opened as a destination rental in December 2016. The 523 sq. ft space offers a parlor, kitchenette, bedroom, and full bath. The parlor includes a sofa, chairs, drop table, and Smart TV. The kitchenette has wormy chestnut cabinets with granite countertops, a refrigerator with freezer, dishwasher, microwave, coffee pot, dinnerware, and cutlery. The bedroom offers a queen size bed and sitting area. The bathroom includes a shower with shower bar and jets, heated overhead fan, and dresser vanity. The backdoor leads to a outdoor patio with a fenced in yard. The outdoor area is nicely landscaped with a offset umbrella, patio table, and fountain. 1. Suitability: wheelchair accessible - The building is wheelchair accessible if the guest is to travel with a portable ramp. Please contact the owner to discuss door width and step rise requirements. 2. The sofa bed has been replaced with a portable full size bed to accommodate two guests. The shower base is ADA compliant. Please contact the owner if detail photos are needed. All sheets are run on a sanitize cycle when washed. All towels are run on a sanitize cycle when washed. K-cups, creamer, sugar, bottled water, olive oil, vinegar, salt, pepper, ketchup, and mustard. The TV runs from WiFi. It is NOT cable or satellite. Small lawn with two recliners and small table. The Yadkin River is within walking distance. Several Outfitters are located close by. Offset umbrella and patio table with seating for four. The Elkin Municipal Park has Tennis courts. The building is wheelchair accessible if the guest is to travel with portable ramp. Please contact the owner to discuss door width and step rise requirements. The Elkin Municipal Park has a seasonal public pool. Maggie’s Place is the best! The attention to detail was phenomenal. It felt very true to the period yet had every modern convenience you could want. The charm of Maggie’s Place and Elkin is wonderful and we can’t wait to return. We spent one night in Elkin while our home in Charlotte was being painted. Maggy’s Place was PERFECT! A small cottage-style home with everything you could need. Mark and Deborah truly go out of their way to provide you with most anything you can think of. Definitely will stay here again when we come back to do some wine tasting. Clean, cute,and quaint. So convenient to everything we wanted to do. A lovely retreat for a couple. The owners were very helpful and nice. Thank you Jeff for visiting with us for your milestone event. I am also thankful to meet you and “your Bride”; and for sharing your weekend plans with us. Lots of fun stuff to do in and around Elkin. Enjoyed my visit to Maggys. Full of antiques, cozy and very clean. Appreciated the flannel sheets! Plan to return on my next visit to Elkin. We couldn’t have asked for a better place to stay for a weekend getaway! This was our 2nd time staying at Maggie’s place. The location right downtown makes it super convenient. We love Elkin! The hiking and wineries make for the perfect weekend combo! My husband and I stayed here when we got married In Elkin last weekend. We loved the history and the decor was charming. It was laid out well, and made use of the small space. We hope to stay here again in the future. It was right on Main Street but still felt private. We think it is one of Elkin’s gems!